BENTONVILLE, Ark., 2015-7-24 — /EPR Retail News/ — After listening to parents across the country, Walmart today announced it has significantly expanded its assortment of baby products and services. The retailer also shared its commitment to lead the baby industry in three key areas: product safety, national brands at low prices,and baby-clock shopping – a term the retailer has coined to describe the moment parents find it most convenient to shop, whether it’s in a store after that well-needed nap or in the still of the night on their mobile device. Retailer enlists Evenflo to bring to market a first-of-its-kind car seat with a technology aimed at the prevention of vehicular heat stroke. 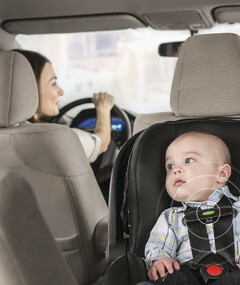 The Evenflo Advanced SensorSafe™ Embrace infant car seat uses a wireless receiver that plugs into a car’s On Board Diagnostic (OBD) port and syncs with the chest clip that goes around the baby. If the car is turned off and the chest clip is still buckled, a series of tones will play to alert the driver. The Evenflo SensorSafe™ car seat is the only alert system crash tested by the manufacturer and will retail exclusively at Walmart for $149.88. Pampers’ newest diaper – Premium Care – now available in stores and online. Premium Care is Pampers’ best diaper and includes features moms love about Swaddlers, such as the wetness indicator, but are also hypoallergenic and made up of a more breathable material to let air circulate to the baby’s skin. To ensure Walmart is delivering the shopping experience millennial parents are looking for, the retailer commits to providing the best “baby-clock” shopping experience by removing the barriers between digital and physical shopping. Customers can see for themselves how Walmart is providing “baby-clock” shopping with its new and improved baby registry. Parents-to-be can now create and manage a baby registry with the Walmart mobile app. Items can be added by selecting products on Walmart.com or scanning a products barcode in a store. Registries will be updated automatically when friends and family scan their receipts with the Walmart mobile app after checkout. For more information, please see Diana Marshall’s blog post on Walmart TODAY. This entry was posted in Baby Products, Children, Retail, Retailer and tagged Baby Products, Diana Marshall, Walmart. Bookmark the permalink.